Ordinarily I’m not a fan of fruit in savoury dishes. A raisin has no business being in a salad but I’m going to let the humble fig off this time, provided it’s teamed with goats cheese. 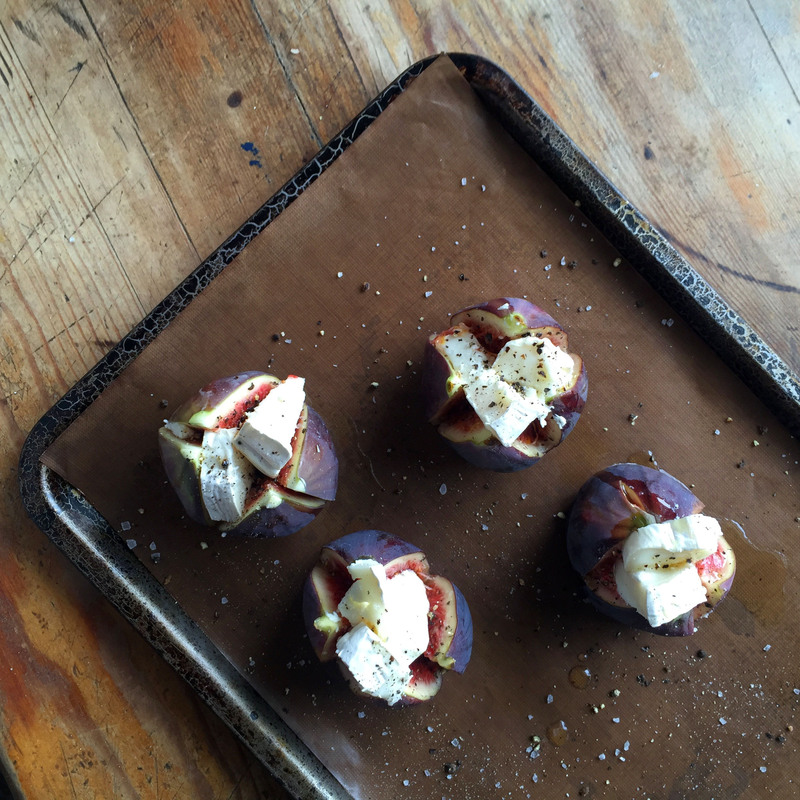 Also, lets be honest about figs, we all know they can resemble a lady’s ‘rude area’ but they’re delicious, so stop laughing and stuff ’em with goats cheese. Speaking of a lady’s ‘rude area’, my gorgeous best friend Rosie has just pushed a baby out of hers, hooray! I’ve been crowned (yes crowned) godmother, which surely deserves a bit of a lactose induced tummy ache. I wonder if my crown is in the post yet? Must be… Welcome to the world baby Logan, have some goats cheese, babies love goats cheese. 1. Preheat your oven to 200c (180c Fan). Slice the figs from the top to about halfway down in a cross (See pic below). Be careful not to cut too far down or you’ll simply cut your fig in half. Pinch the bottom of each fig gently to open the fig slightly. 2. Pop your figs on a baking tray and roughly divide your goats cheese into eighths and stuff each fig within an inch of it’s life. The more cheese you get in the better. 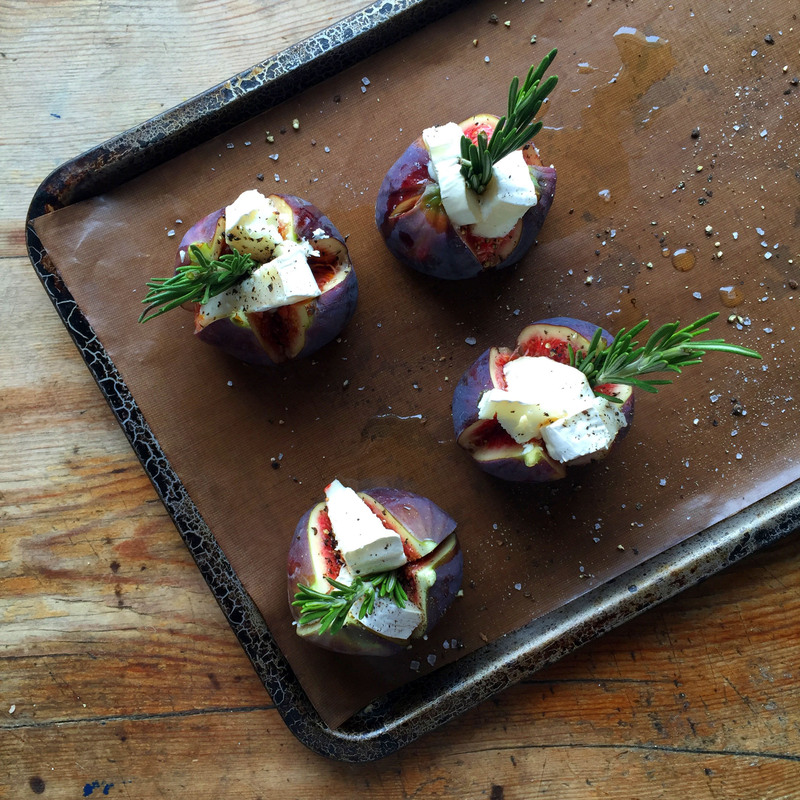 Stuff a rosemary sprig into each fig, season with salt and pepper and drizzle each fig with half a tsp of olive oil. Pop in the oven for 20 minutes. 3. Mix the leaves, cucumber, red onion and the lemon zest in a bowl. Season with a bit of salt and put to one side. To make the dressing, simply mix the ingredients together until combined. 4. Put a small saucepan on a medium to high heat, add the pine nuts and toast for a couple of minutes. Keep them moving or they’ll burn. Add them to the salad along with the dressing. 5. Remove the figs from the oven and pop them carefully on a plate. Don’t worry if some of them have split, they’ll still taste great. Drizzle them with a teaspoon of honey and serve with the salad and a lemon wedge.